San Diego Mayor Kevin Faulconer announced plans Monday to reinstate a ban on living in vehicles parked on residential streets, while also expanding the city’s Safe Parking program, which provides parking lots for homeless individuals to stay while working toward establishing a permanent residence. The ban would coincide with an expansion of the city’s Safe Parking program, which provides nighttime parking for citizens who live in their vehicles. 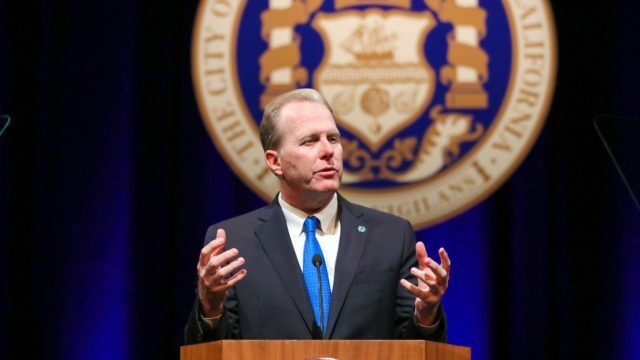 Faulconer plans to add three new lots, which would provide more than 100 new parking spaces for those in need, with a goal of providing a temporary place for the homeless while they search for employment and/or permanent housing. The program currently serves more than 200 adults and children and has helped more than 30 families transition to permanent housing, according to the mayor’s office. The ordinance — expected to be considered next month by the City Council’s Public Safety and Livable Neighborhoods Committee — would replace a previous, longstanding vehicle habitation ban that the council repealed last month, following a court ruling that deemed the measure too vague to properly enforce, according to Faulconer’s office. The repeal generated outrage and concerns over public safety and health in San Diego’s beach communities.